PC Speed Cat is a potentially unwanted program. It means that the program might exhibit undesirable behavioral patterns, but it is not a malicious infection. A malicious program enters a target computer without user’s permission. This program, on the other hand, requires user’s intervention, although most of the users would say that they did not intend to install this application on their computers. If you are one of them, you can scroll down to the bottom of this description for the manual removal instructions, and remove PC Speed Cat from your system. There are a lot of system optimization tools out there that are supposed to improve your computer’s performance. Technically, there is nothing wrong with it, but we have to remember that programs should not be tolerated if they enter target systems unexpectedly. Although we have mentioned that this program requires your intervention to enter your computer, it is very often that users install such apps accidentally, when they come bundled with other freeware. PC SpeedCat is the one-stop PC performance Optimization software for everyone. Quickly scan your PC, and let PC SpeedCat determine your optimal settings. In other words, this program should help you tune your system if something is off. However, it will not do that for free. 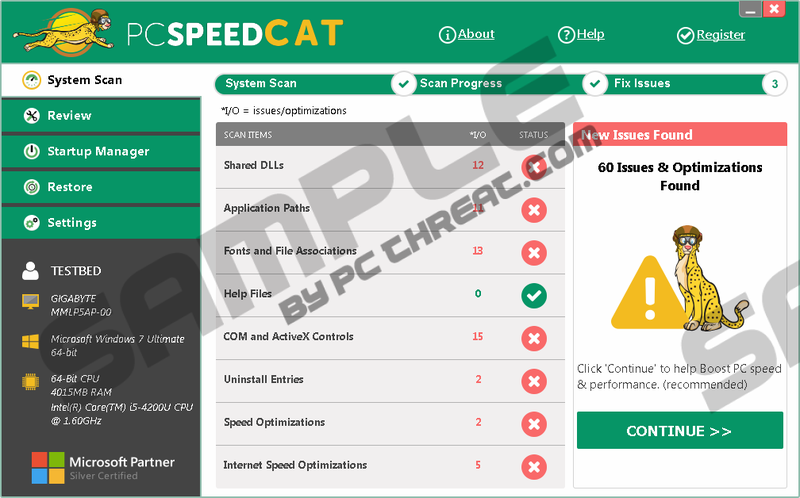 You can buy the annual subscription for 30.25USD, although the program says that it can help you solve three issues for free, our research team says that PC Speed Cat does not indicate the three “problems” during the test. In other words, the program does not provide information on the issues that it claims to be able to solve. What’s more, the information on the main website suggests that PC Speed Cat may collect your personal information. It says that they can collect email address and credit card numbers (if you purchase the subscription). It also says that the information is collected to develop better service, but it is not clear where exactly this information can be used, and whether it is protected from malevolent exploitation. In this case, computer security experts would tell you to be extremely careful about what type of information you share with this program. Also, if you did not download this program from the official website, it could have slipped into your computer accidentally when you downloaded some freeware application from a file-sharing website. If you download a new program, make sure you get it from its official vendor; otherwise, it is very easy to install multiple unnecessary applications. It should also be a common sense to go through the installation wizard instead of skipping the steps. If you were to pay close attention to every single step, you probably would have the chance to avoid adding PC Speed Cat to your system. Once again, this computer optimization tool is not a malicious infection. If you did not want it, and it is still there, you simply missed the chance to avoid installing it. However, even if the program is not malicious, you should not keep it on your system when you did not want it. Hence, the sooner you remove PC Speed Cat, the better. If this program came bundled with freeware, you will do yourself a favor by scanning your system right now and checking it for other potentially unwanted apps. Please remember that such apps often travel in packs, so if there is one unwanted application on-board, you most probably have several other uninvited guests. You can uninstall PC Speed Cat via Control Panel. This program does not leave any files or registry entries, so you won’t have to worry about it. Nevertheless, you should still scan your PC with a security tool to be sure that your computer is safe and sound. To avoid similar unwanted programs in the future, refrain from downloading apps from file-sharing websites. Do not click random pop-ups, and do not hesitate to invest in a licensed antispyware tool. Finally, if you have questions, please feel free to leave us a comment. Select Add or remove programs and uninstall the app. Quick & tested solution for PC Speed Cat removal.